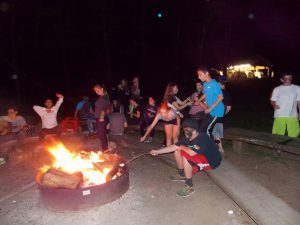 On Tuesday night, we had a fun night of pitching tents, BBQ, p rison break and s’mores. Unfortunately, we were unable to sleep outside because of the thunder, rain, and lightening. We still enjoyed our almost overnight, though! Wednesday night was Rikudiyah, and all of Arayot preformed a beautiful dance to “Lev Chofshi” (my free heart). Shout outs to Hannah S., Alexander B., Sophia F., and Noah L. for their solos at the beginning of the dance. 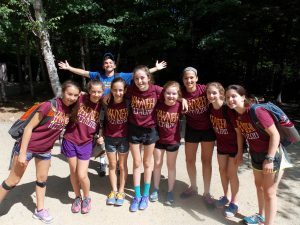 After Rikudiyah, there was Maccabiah break out and the chanichim (campers) had their first team meetings. The team names this year are Achva (brotherhood/sisterhood) and Reut (friendship). Thursday was our achla yom (trip day)! We woke up bright and early to climb Mount Monadnock. We had perfect weather for the hike and a beautiful view from the top. It w as a fun hike with plenty of rocks to climb up and blueberries to pick along the way. Last night, we ended the night with the first activity of Maccabiah, Le’mala-le’mata (under-over). Today we will continue more competitions in Maccabiah and get prepared for our last Shabbat!! !